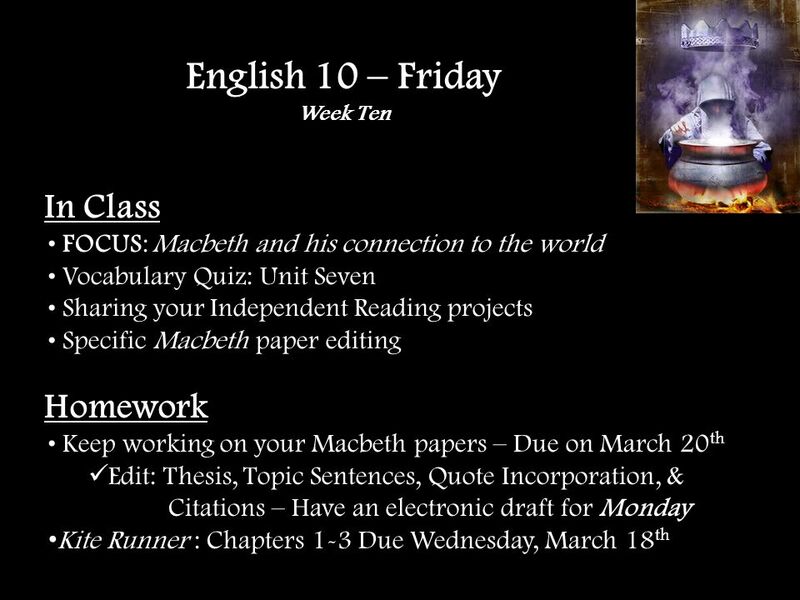 In Class FOCUS: Macbeth and his connection to the world Vocabulary Crossword – Unit Seven Peer Editing – The Whole Paper SAS Curriculum Online Turn in. 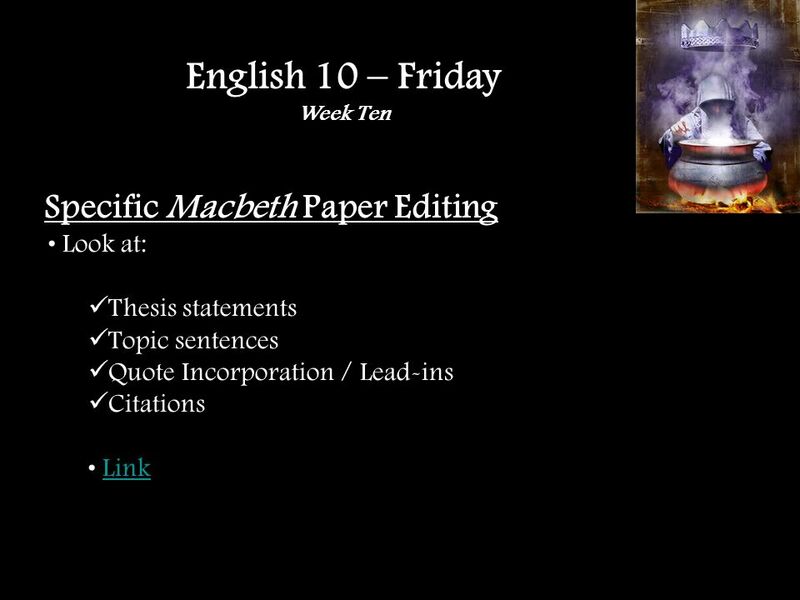 Download ppt "In Class FOCUS: Macbeth and his connection to the world Vocabulary Crossword – Unit Seven Peer Editing – The Whole Paper SAS Curriculum Online Turn in." American Lit: Week 9 Week’s Agenda: Finalize body paragraphs today. 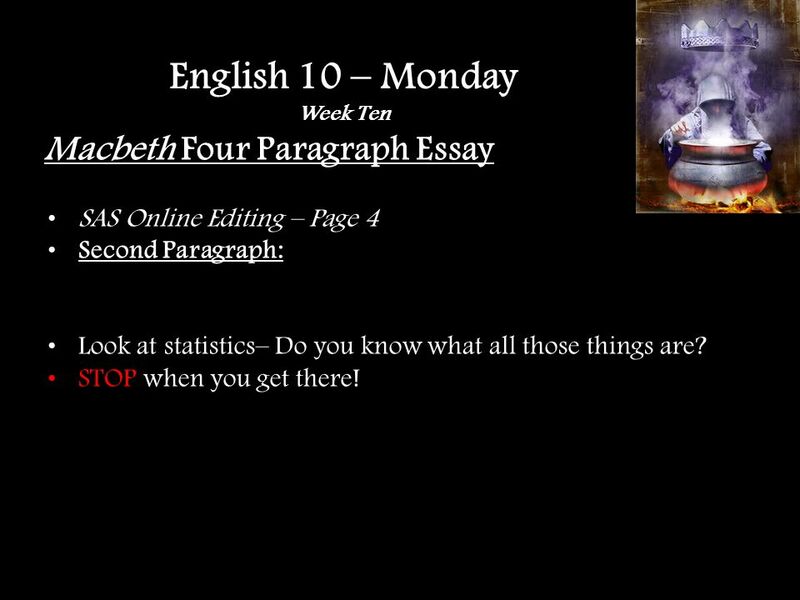 Week 10 OA Power Point. 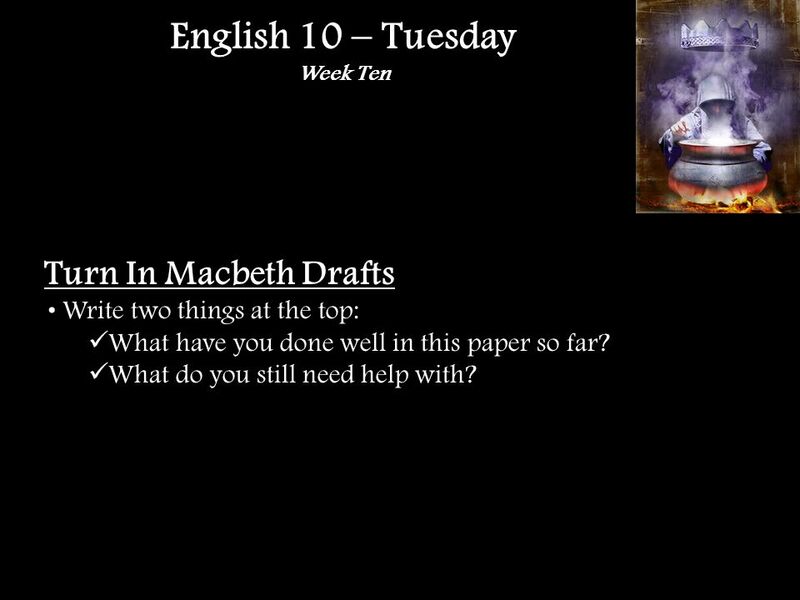 In Class FOCUS: Macbeth and the role of The Double Macbeth Act Three: Scenes Five and Six What did you pull out from the last two scenes? Who do you think. 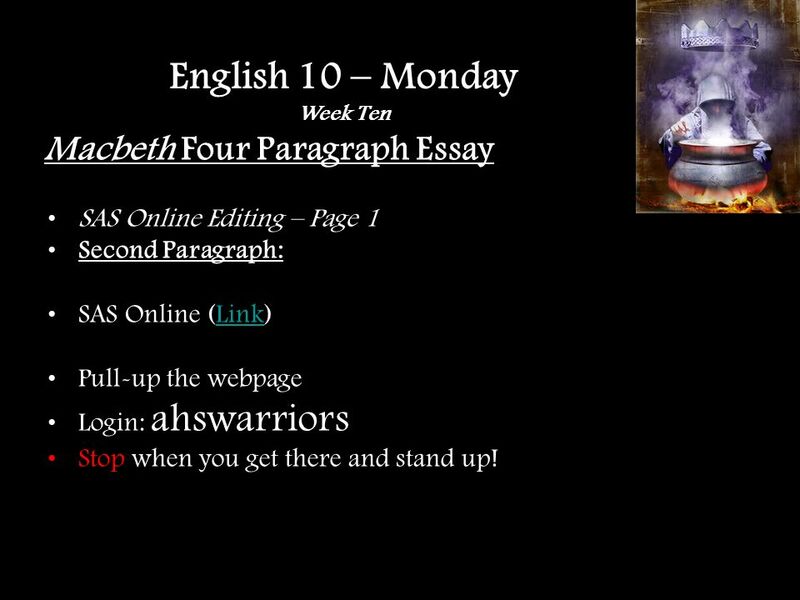 In Class FOCUS: Macbeth and his connection to the world Collect CSAP Packets Watch film versions of Macbeth 5.7 – Whats the connection? Macbeth – Four. 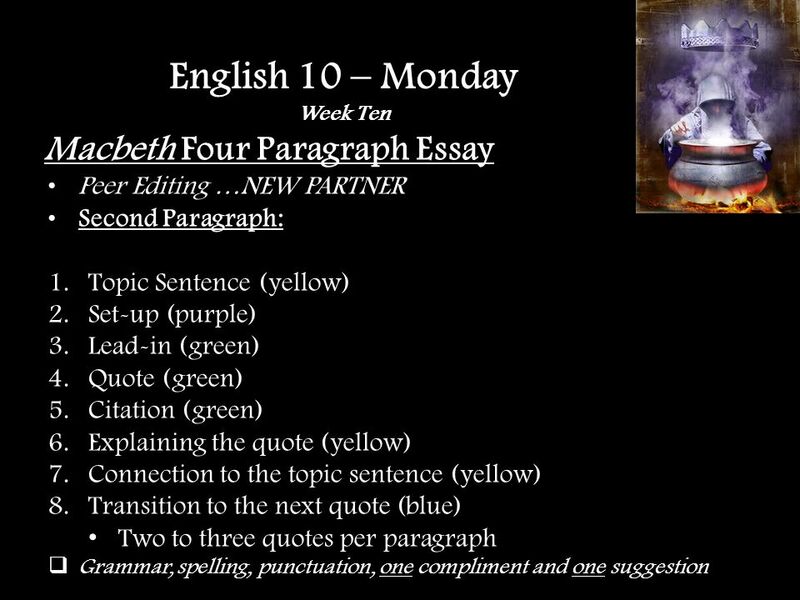 Scribe, individual conferences, Check PLN 5, Vocab word of week: miscreant, Poster Paper mapping of stories: connect ideas How do words and actions affect. F RIDAY D ECEMBER 9 TH Today, I will 1. 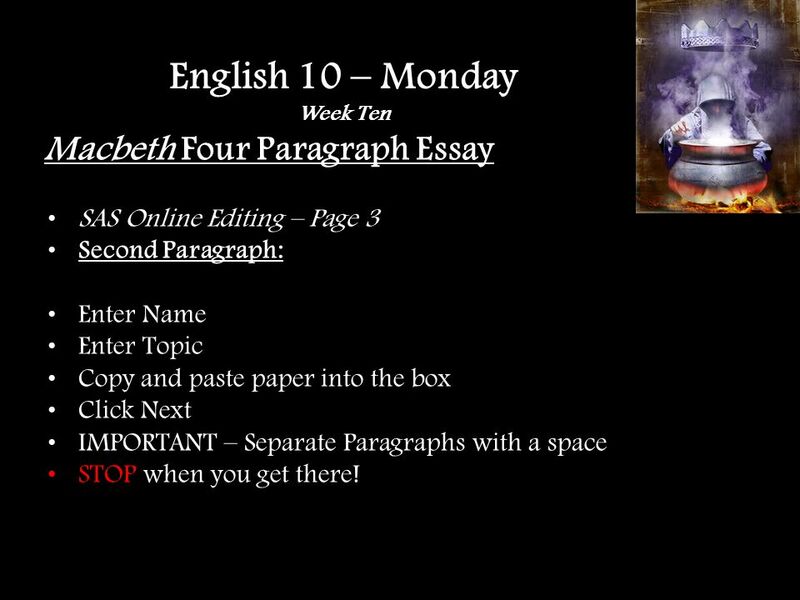 Self-edit my paper 2. 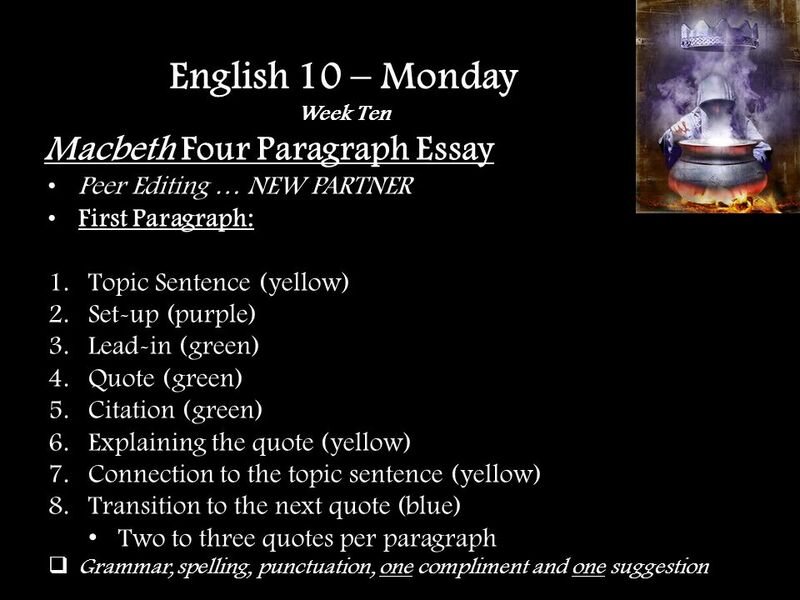 Score my paper for the content standard using the rubric Materials: paper, pen/pencil, 2. 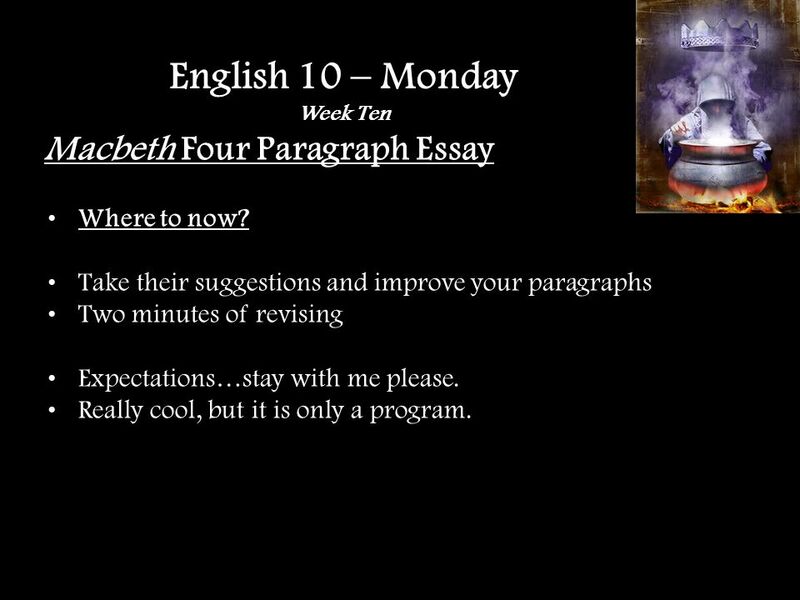 Sr. Paper Peer Revision #2 Intro. + Body Paragraph #1. 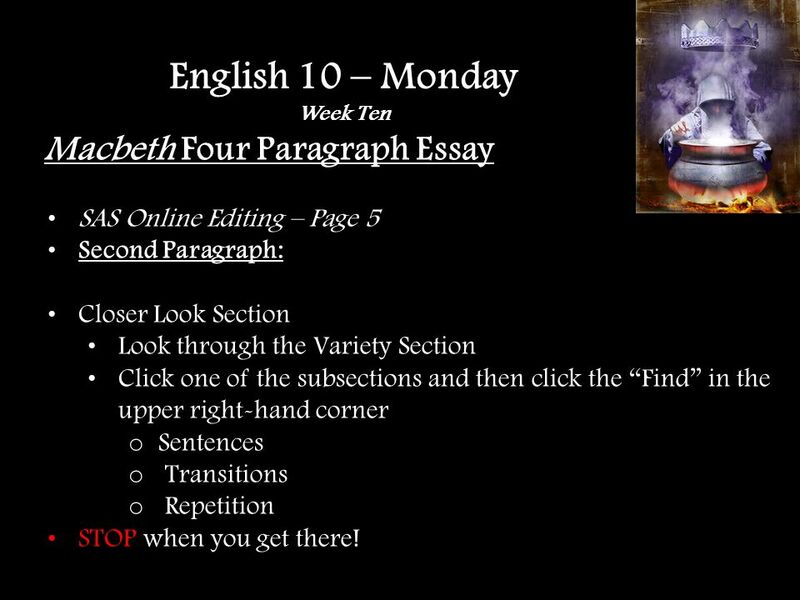 The Essentials of Writing a Literary Essay A 12-Step Process. JUNIORS. Do Now: Get into your writing groups. Write your thesis sentence on a separate piece of paper. 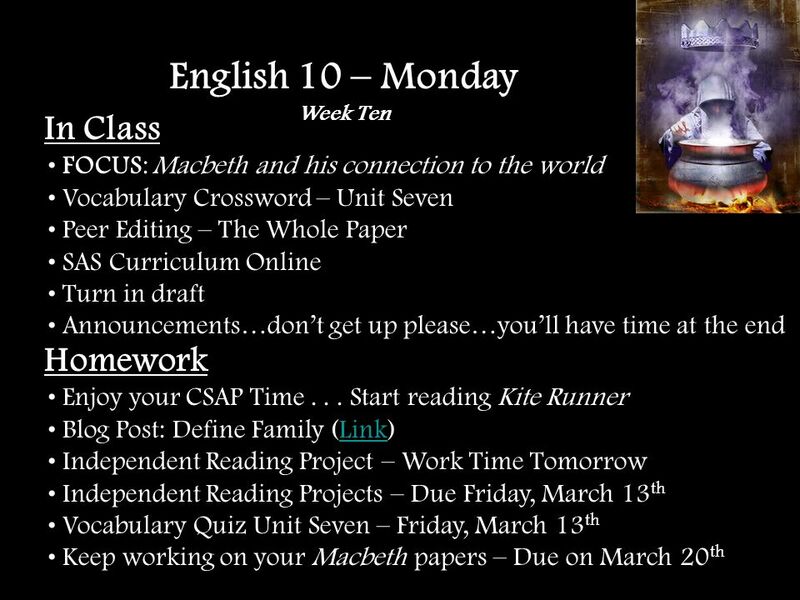 HW REMINDERS: -QUOTE WORKSHEET FOR INDEP. READING. Chapter 10. 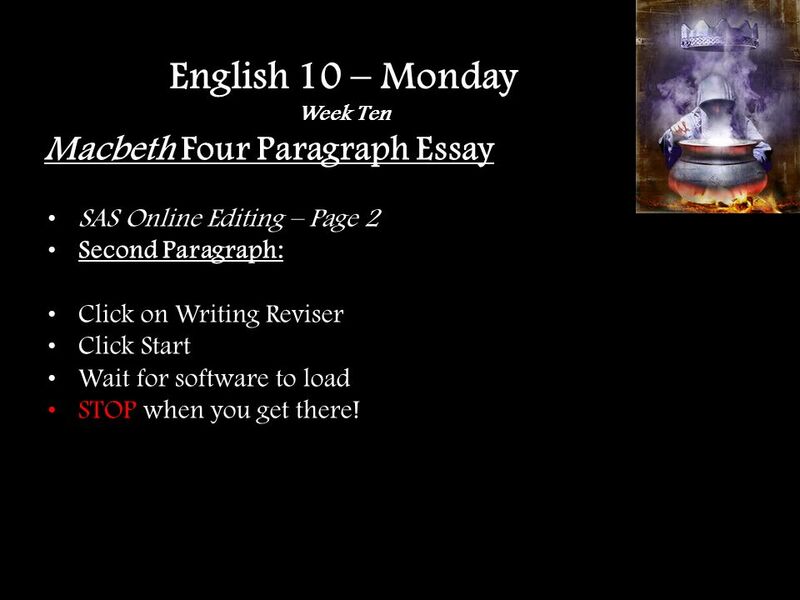 Last week we talked about making the switch from writing paragraphs to essays. 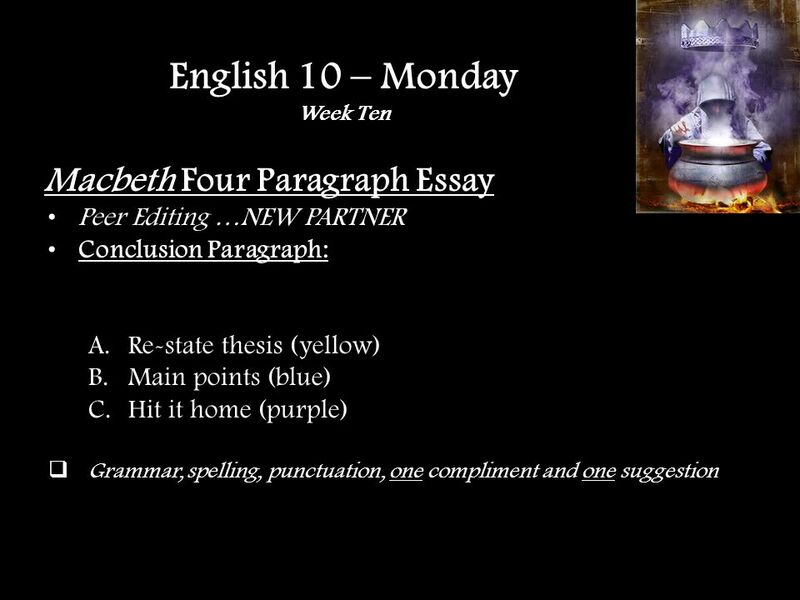 We talked about how an essay is made up of the same kinds of. 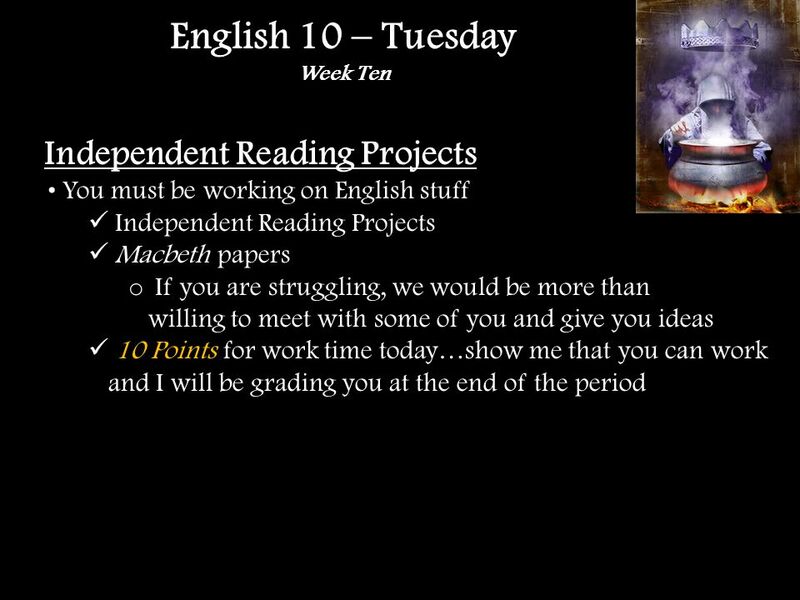 Procedural Text Grade 6 Language Arts. 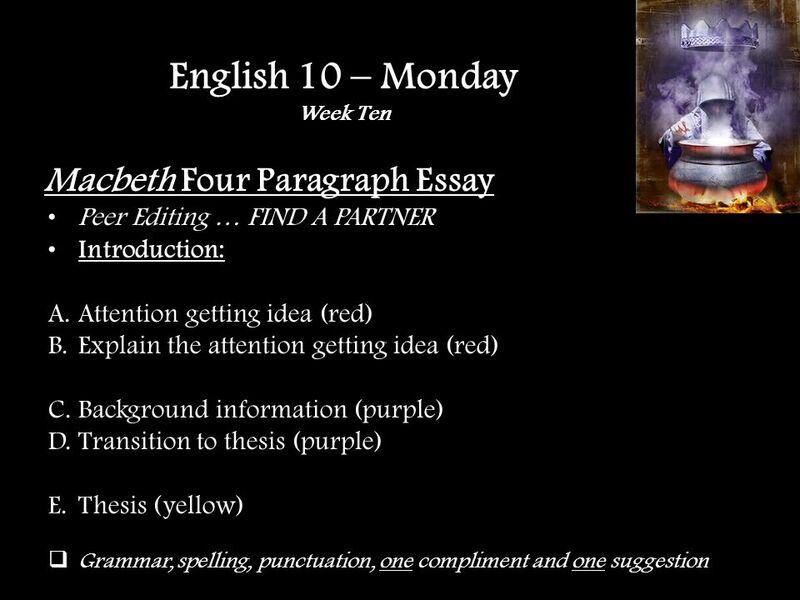 TODAY’S GOALS Peer review the second draft of your WTE essays Continue refining your theses and adding details to the body paragraphs of your WTE essays.